My motto is “glitter makes everything better,” and apparently I’m not alone. 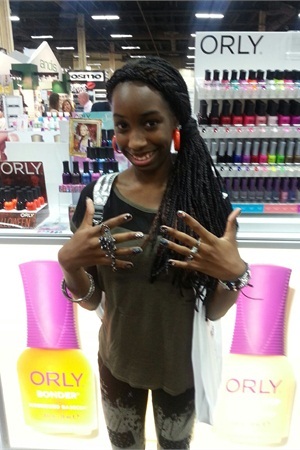 As the founder of nonprofit Polished Girlz, Inc., since age 10 I’ve been bringing the hottest nail trends to my clients nationwide — that includes girls with special needs or who are hospitalized. So imagine my excitement (now at age 13) that I’m allowed to share the newest trends from Cosmoprof North America with the readers of NailsMag.com. The first thing that I noticed when I walked onto the Las Vegas show floor was vendors of beauty products for every industry from hair to skin to nails. 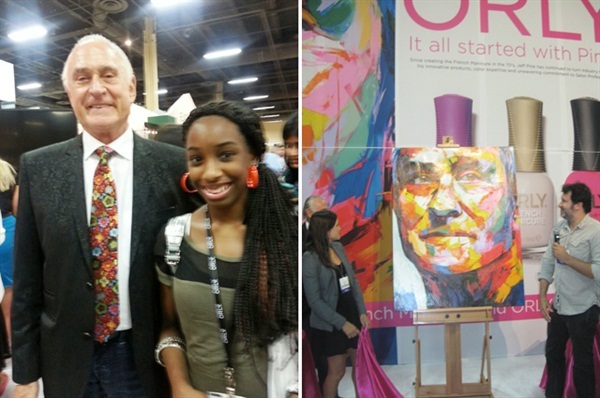 It was totally mesmerizing, but the main thing that caught my eye was a large pink covered art canvas at Orly’s booth. I was so full of anticipation of what the company’s big announcement might be that I could hardly wait, but I would have to since that announcement wasn’t coming until 4:30 p.m. In the meantime, I was officially ready to start my hunt for the hottest nail trends. My first official stop was at the China Glaze booth. I spoke to Tori Matt and asked what the future held for nails. For the rest of 2013, China Glaze has a new fall collection of jewel tones called Autumn Nights. Matt sees the trend of an aluminum finish in colors this year. 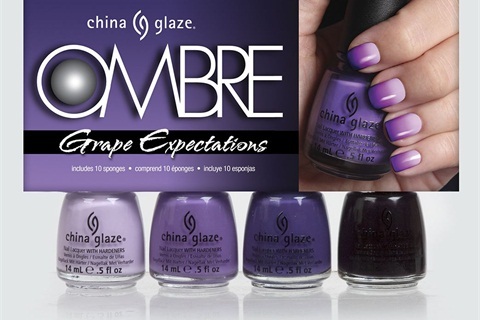 We will also see many textures coming from China Glaze. One other cool trend is ombre nails and China Glaze has a how-to kit that includes everything you need to create the perfect ombre design. It comes with instructions and a sponge brush for easy application. From China Glaze parent company American International Industries, my personal favorites were the Stripe Rites by It’s So Easy. They are stripers that come in many cool colors and can be purchased at Sally Beauty Supply, so everyone from beginners to pros can do creative nail designs. 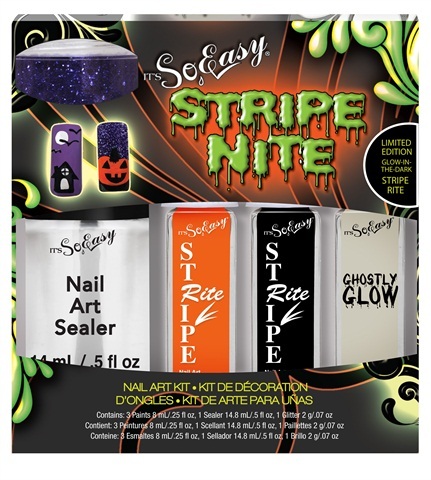 Stripe Rite also has a Halloween collection coming out called Stripe Nite, which features a glow-in-the-dark striper brush, plus a Glitter Wonderland collection featuring snowflake glitter and holiday striper colors. After I left the AII booth, I went back to the Orly booth to interview John Galea. Galea also sees jewel tones as a trend and lots of glitter in Orly’s future. For textures, Orly has a new collection called Mega Pixel that uses crushed glass and gives the polish a bright shine. The polish feels kind of like sand when it is dry but is highly reflective and has a 3-D look almost like a disco ball. I’m very familiar with Orly products because they’ve been very supportive of Polished Girlz’ mission for several years now. I might be biased, but I think my favorite Orly product may be Polished Girlz Pink! My next stop was the Essie booth. 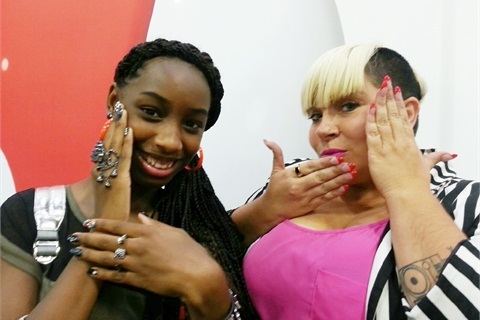 There I got to meet with Naja, the celebrity nail artist from the hit TV show LA Hair. Naja has polished celebrities from Lady Gaga to Beyoncé. Naja told me Essie will give us dark rich colors for its fall line. When I left Essie’s booth I went back to Orly’s booth to watch the big press announcement. It was the unveiling of the canvas and a video short of the history of Orly, as directed by Jeff Pink’s daughter. It was amazing! 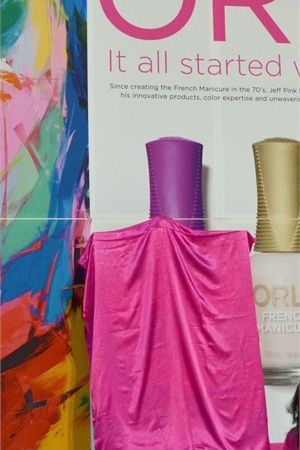 When the pink sheet was removed there was a beautiful painting of Pink himself, who started the French Manicure many years ago. Plus, Orly announced the kickoff of the new “It All Started With Pink Campaign.” I was so honored that I actually got to meet Jeff Pink and was there to hear the announcement. I had so much fun at Cosmoprof — getting the inside scoop on the newest, coolest nail trends and meeting the people behind them. 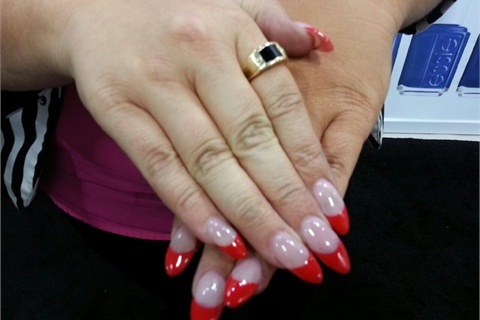 There were so many of the top nail industry leaders represented at this show. I just felt proud to be a part of it and able to learn about them all. Alanna Wall is the founder of Polished Girlz, a 501c3 nonprofit organization that hosts mini mani nail art parties for children with special needs or who are hospitalized. With teams nationwide and well over 2,000 clients, Alanna’s goal is to bring the fun energy of the nail industry to the girls that need it most, while teaching them the importance of hand washing. To learn more about the Polished Girlz, visit polishedgirlz.org or follow the nonprofit on Facebook and Twitter @Polishedgirlz.